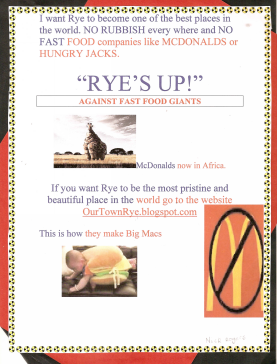 Rye's Up Against Fast Food Giants. Our Town, Our Choice! Well, our last tree planting was so successful, we are doing it again! At our last event we planted well over 500 plants in under 90 minutes so we upped the challenge. 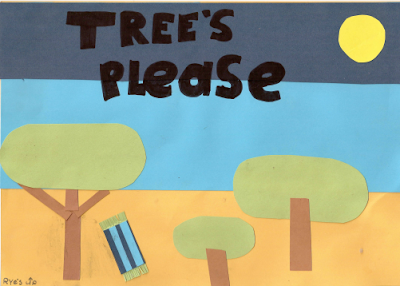 Our goal this time is to plant 1,500 trees in one day, and for this we need your help. Come along to the Whitecliffs Foreshore (at the end of Elgan Avenue) at 10am on Sunday 11th October and help us to get these plants in the ground. Bring along some gardening gloves and community spirit and the rest will be provided for you. Rye residents are still keeping an eye on the fast food giants despite no applications coming before Mornington Peninsula Shire Council. The shire has received 750 submissions to date opposing fast food restaurants in the Rye township. Shire statutory planning teamleader Arthur Cooksley told a recent community council meeting at Rye Civic Hall that "preliminary discussions" have been held with Hungry Jack's representatives but there had been no further contact "from any restaurants or their consultants". A McDonald's spokeswoman said the company remained "interested in the potential for a restaurant in Rye" and would continue to look at options. Hungry Jacks development department national manager Bob Shergold said the company was "still interested in Rye and still looking for a site". 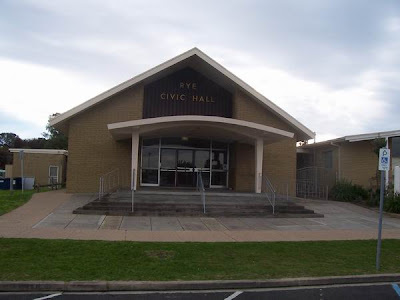 The upcoming Council Meeting, to be held on Monday 14th September at Rye Civic Hall at 6pm, has an agenda item of "Community Concern - Convenience Restaurants and Additional Supermarket in Rye". That's us!! The full agenda and report can be found by clicking here. This council meeting is open to any member of the public and it would be great to have some support for our cause there. It is VERY important to note that this meeting covers many issues and it is essential that anyone who attends is quiet and respectful. If anyone attending has any questions there will be a form that needs to be completed, this can be done on the night before the meeting. Alternatively any enquiries and questions can be lodged via custserv@mornpen.vic.gov.au. This facility can be used at any time for any issue. For those planning to attend the council meeting there will be a buffet style meal available on completion of the meeting. To attend this you must RSVP to Kylie Osborne on 5950 1137 by Thursday Sept 10th. You DO NOT need to RSVP if you simply wish to attend the meeting and not partake of the buffet afterwards. Apologies for the short notice but this matter has just come to our attention. We hope to see some of you there! We have heard that at least one of the local papers will be covering the issue so it would be great if they could say a "packed house"! Katrina Humphrey & Rye's Up! We have 500 trees and ground covers to plant and we need your help! So come along to the Rye foreshore, opposite Elgan Ave, between 11am - 2pm and lend a hand! Bring along your community spirit and a pair of gardening gloves and help us improve the foreshore and reduce some of the carbon footprint of these fast food giants. 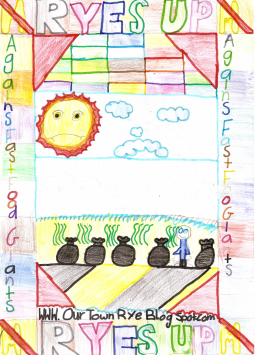 By the way, full credit needs to be given to Max Bainbridge (Grade 6, Rye Primary School) for the artwork in the poster above! Everyone knows that big businesses have an enormous effect on our environment, and fast food giants are no different. In fact it has been estimated that your average cheeseburger produces 3.6-6.1 kg of CO2-equivalent. That's an awful lot. Check out this website for some more details. Rye's Up! has never wanted to be a group of just 'nay sayers', in fact our entire purpose is to improve our wonderful town, and to do that we need your help. 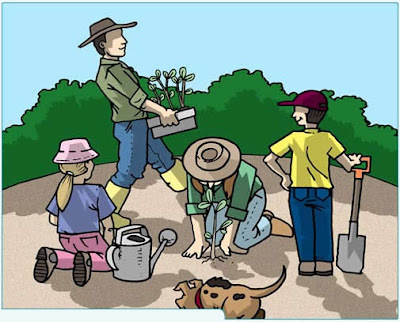 We are asking everyone to come down to the Whitecliffs foreshore, on Saturday 5th September between 11am and 2pm to adopt and plant a tree. The shire has generously offered to donate as many trees as we require, so it would be incredibly helpful if we could get a rough idea of the number of people willing to get their hands dirty for an important cause and a bit of fun. Just a quick email back to me (dixonkatrina@hotmail.com) would be great. Let's not only help balance some of these enormous carbon footprints, but help our town out at the same time. I ask you, what could be better? Congratulations to Paige for her wonderful poster below! Paige wins a $20 Peninsula Surf Voucher and $50 cash! The following fantastic posters also deserve high praise! We'd like to thank all of the students that entered... we were so surprised by the ingenuity and talent! Congratulations to Ned for his wonderful 43 second video on Rye. We will feature it here as soon as possible. Ned wins a $20 Peninsula Surf voucher and $50 cash! All details can be found by clicking here. The competition is open until Friday 26th June. The prizes will be announced in the next couple of days but they'll include cash and vouchers for use in local stores!! And last, but not least, you'll get your name up in lights! 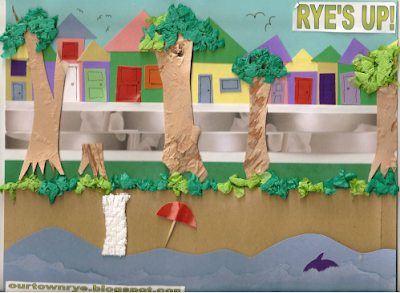 Hi, my name is Katrina Humphrey, I am a representative of the Rye’s Up! Campaign. I would like to say welcome to everyone and thank you for coming. A quick favour, could anyone who attended the last town meeting please advise those around you who couldn’t make it that I did insert several jokes at this stage last time, unfortunately I used up my entire bag of tricks then. And from that piece of good news – on to the rest. There is a huge amount of information to pass onto you tonight and we must try to be as orderly and respectful to everyone as possible. There will be a designated time this evening for questions and discussions, I would greatly appreciate it if everyone could understand the difficulties and nerves that standing up here produces, and that any comments be left until the appropriate stage. Now, a quick recap! McDonalds and Hungry Jacks are looking at coming to Rye. McDonalds looking at the site on the corner of Point Nepean Road and Dundas Street (Sorrento side), the location of two of Ryes oldest homes, Hungry Jacks looking at the land next to Peninsula Surf Centre, just passed Safeway. Both businesses have confirmed they are planning on infiltrating Rye, however, neither have given final confirmation on locations. So much has happened over the past six weeks. A committee has been formed, full of the most amazing people, local traders, mothers, retiree, professionals and this committee has been working flat out – and actually achieving things. Realistically that may have us needing to change our name – a committee doing things, who would have thought it? Of course once the committee was formed we needed to do lots of things, and coming up with a name was one of our top priorities. I have to say, I had an absolute blast with this one. A general call out for assistance was made and from that I had emails, people stopping me in the street – complete strangers walking up to me for a discussion and passing their vote – absolutely fabulous. I was even doing a radio interview on RRR and someone called up with a suggestion. John, if you are here, ‘Support local traders, not corporate invaders’ was fantastic and really does some up a big part of our campaign. Things like ‘Don’t pillage our village’ and ‘Save Our Strip’ followed the same lines. Then there were some wonderful play on words like ‘Sack Jack and Mack’ and ‘Hit the Road Jack and Mac’. More positive sounding names such as ‘Our Town – Our Choice’ and ‘Golden Sands NOT Golden Arches’ were suggested and even some of the adults only variety, that I can’t mention with children in the room, but certainly gave me a giggle on those long nights spent working at the computer. Our name actually eventuated as a bit of a communal effort, the way many great things are created. Tim Richardson of Picknics Café came up with ‘Ryes against McDonalds’, a brilliant name, but we were hoping for something that would lead us into a positive future. From that Miranda Gillespie took it for a bit of a U turn and arrived at Rye’s Up! But then we needed a bit of an explanation, so the rather mundane, but essential ‘Against Fast Food Giants’ was added by the committee. A big thank you to everyone for their ideas – it was lovely hearing all the thoughts and it also gave an insight into what was important for the people of our town. From that and a lot of other research we have developed the campaign goals “We oppose fast food giants setting up operation in Rye, whilst working to maintain and enhance a unique, inspiring and individual village that enhances all the wonderful natural and community built aspects of Rye“. The next step was to become a legal entity and to create a united front to the town. Therefore we approached the Rye Beach Action Group to discuss the possibilities of becoming a sub committee. We were accepted and welcomed based on the fact that our overall goals were so similar and complimentary. The Rye Beach Action Group is working on their own projects, such as a community directory website (a link for which can be found on our blog), foreshore plans and even being the umbrella organization for other sub-committees, investigating the roads and traffic problems in town, a friends of the foreshore group and a rubbish removal and beach clean up team. Having all of these groups, some of them suggested and formed since the last town meeting, gathering under the incorporated Rye Beach Action Group means we can work closely together to ensure Rye becomes the great town we all want, while still being able to focus and achieve our original goals. I was and remain adamant that the only way to stop these fast food giants becoming our neighbours is by being focused and almost single minded on our goal. Joining the Rye Beach Action Group will only help us achieve this. It is also one of the many ways that we are able to keep the community informed. Not just residents, but ANYONE who visits Rye. Rye’s Up! Has its own blog site, we have information and links back to us on several other websites. 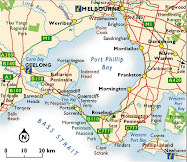 The newly created Rye Beach Action Group site, Peninsula Speaks, Marvelous Melbourne, Our Community, Radio 3RPP to name just a few. 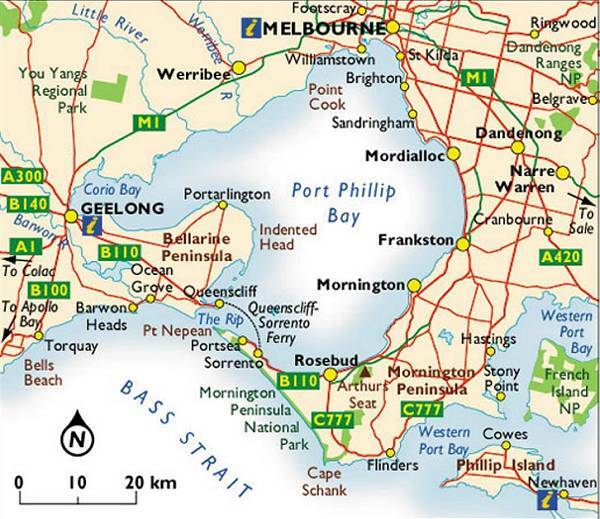 For those not able to access us through the computer, two information centres have been set up, Whitecliffs General Store, just passed Elgan Avenue on the western end of Point Nepean Road and Picknics Café near Hunt Street the opposite end of town. These stores will be able to supply up to date information on events and the current situation, as well as petitions, letters, address details, posters and any other paperwork required. Another way we are keeping the word out there is through the media. The local papers, Rye News, The Mail and The Leader have been following the story. Local radio station 3RPP has interviewed me on both their environmental programme ‘the Green Room’ and their health and food programme. Reaching a more wide spread audience, radio RRR interviewed me on their Sunday morning show ‘Radio Marinara’ that focuses on issues relating to the bay, and the following day held a discussion entitled “Community control over our Main Streets” with Jason Black, President of the Victorian Branch, Planning Institute of Australia regarding the general issue of multinationals invading small town shopping strips. The Rye’s Up! Campaign was the inspiration and the main point of reference throughout the segment. All of these media pieces are, or will be available on the blog. Hopefully there will be many more as I try to get our story in the more main stream, Melbourne based press – but it all takes time. For all the components of the campaign that are seen by the town, the letter writing, the posters, marketing, media and events, there is also the very real and serious administrative and research work happening behind the scenes. Members of the Rye’s Up! Committee are meeting with and lobbying councilors and creating a proposal to present to the shire and councilors regarding the concerns and precedents that allowing these inappropriate multinational developments will raise. Also, we are starting to undertake research into planning and legal matters if it arises that permits are submitted to council by any of these fast food giants. Basically, we are trying to be prepared for any eventuality - that certainly does take time. In more visual terms, Rye’s Up! has now collected over 600 letters of objection and 500 petition signatures. We have been and will be attending Rye and Tootgarook markets and everyone has probably heard about our event ‘What A Load Of Rubbish’. It certainly seemed to be the talking point of the southern peninsula for a while. For those of you unable to come to the foreshore to visit us, we attempted to demonstrate the amount of rubbish that one McDonalds restaurant produces in a day – 125kg. Not including the drive through and not including the second threatened multinational Hungry Jacks. I will also make note that these calculations stem from McDonalds themselves – make of that what you will. Those driving along Point Nepean Road would have seen 100 of the large black garbage bags, many filled with balloons, because as a group, including businesses, we could not collect enough clean non-perishable rubbish. .
All of our ‘rubbish’ was handled responsibly, contained in strong bags, continually monitored while in situ in town and then mostly taken and recycled, although, their were a few happy children around about who got to take home big bags full of balloons. I know my house is still full of them. Even if McDonalds and Hungry Jacks deal with all of their rubbish so responsibly, and lets face it, its not likely, it is still an awful lot of pressure being placed on our tip and landfill. I would like to make a very big and important point here. The Rye’s Up! Campaign is fundamentally about the love and improvement of Rye. At no time would we knowingly do anything that would harm or damage our environment or community. All of our activities are and will be carried out legally, responsibly and respectfully. Now is the time that I take a deep breath, because it is the belief of the Rye’s Up committee that, drum role please, the Point Nepean Road and Dundas Street site – the location of the Palms house, is now SAFE from McDonalds. Of course we are thrilled by this development, but there are some very important things to remember. First, things change, situations alter, basically nothing is guaranteed. It is my belief, the belief of the committee and also the belief of many of the community that McDonalds is not welcome ANYWHERE in our town! So the fight continues as before, with gusto, passion and professionalism. Rye’s Up! will not slow down, will not back off. But we will be saying, with smiles on our faces, that our voices are being heard. And THOSE are some words that can be spread!!! We are aware that a lot of people are concerned about the future of those old homes, and although our campaign is about saving all of Rye from the fast food giants, we will also do our best to keep people informed of ANY planning developments that may arise for the Palms and its neighbour. However, the only way to ensure you are kept informed is to register with the planning department at the shire requesting information on any developments for 2461 to 2465 Point Nepean Road. Fingers crossed that that will be the end of the controversy for those beautiful homes. As much as it would have been lovely to keep the best news for last, I was never very good at secrets, so there you have it, but don’t all rush for the door yet, there is a lot more to come. But now that I have blurted out the big news, I can be a bit more orderly. Who on earth could follow such an enormous announcement – some kids of course. Here is the opportunity for us to remember that not only do children live in our town, they will probably be here a lot longer than the rest of us, they have their own very specific needs and they certainly spend time thinking about what they want and need from their environment. 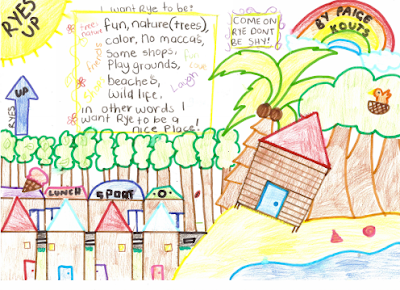 I would like to welcome Sophie Armstrong and Taylah Hensle, both students in Grade 6 at Rye Primary School to enlighten all of us on the general views of the kids in Rye. How brilliant was that? Kids are the most amazing things, and not only are they important in the community, they should be consulted in regards to the way the town travels – they obviously think about it in an intelligent and responsible manner. 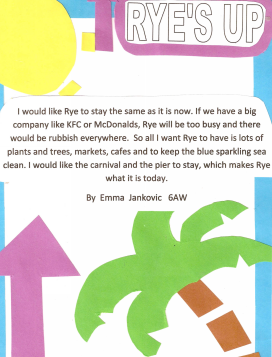 You will have noticed around the room some of the projects that have been carried out by children in Grade 5 and Grade 6 at Rye Primary School. These incredible children are studying the issue of development in Rye as part of their media studies component. It is a very local issue that affects them all, and the thing that impresses me most is that not only are all the issues being explored, but peoples varying opinions on the matter are being embraced and accepted. Let that be a lesson to us all. We thought it would be wonderful to harness their passion and enthusiasm, as well as helping inspire the kids and show they do have a voice in our town, so we have created a competition for them. Everyone will have noticed that ‘Spread the Word’ is a much repeated phrase by us at present. One of the ways we are currently doing this is with posters and flyers. We thought this is a great opportunity to invite the children to get involved and design and create their own. The posters will be judged by the Rye’s Up! Committee, and the winning poster will be distributed far and wide. Similarly, we would like to invite children to create a short video for us, summing up want we do and don’t want for Rye to help explain our campaign. The winning video will be uploaded to You Tube and also sent to several media outlets, with the hope that one of the TV stations will run it. There will also be cash and prizes of course! If you would like any further information on these competitions, it will be available at the end of the meeting and on the blog shortly. 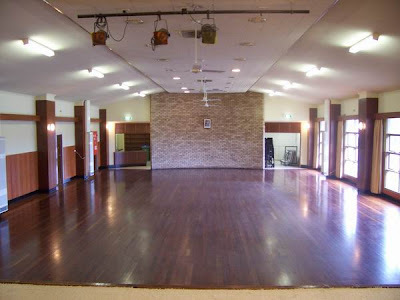 I would now like to invite Martin Dixon, State Member for Nepean, Shadow Minister for Education to speak to us all in regards to his position on Rye’s development. With all the wonderful news and fantastic response we have received so far, we now need a future plan to lead us in the direction we wish this town to travel. Obviously we need to continue with the letter writing component. It is vitally important that the shire and the fast food businesses do not think that we have forgotten our goal. My question is, how often can we say ‘Hey, No McDonalds!’ before what people hear is ‘blah blah blah blah, whinger annoying blah’. I’d say at the minute we are getting pretty close to our limit. This of course does not mean that we forget our goals or step away from the cause, it just means that we approach it from a different angle. But, let me tell you, this is where the fun stuff starts. No one wants to spend their time focusing on what we don’t want when there is so much available on our doorstep. What better way to get the town that we desire, and safeguard the lifestyle we love, than by living it, daily. Even better, lets encourage and allow others to do the same. That leads me to two pretty radical yet amazing ideas. How many of us have walked down the shopping strip of Rye and complained about the vacant shops, the fruit shop that doesn’t exist, the gift shop that is no longer there? Lets fix it. It really is so very simple. There is an American theory, that roughly translates to the Australian market, it is called Project 3/50. Basically, if half the employed people in a town spend $50 per month in 3 different locally owned, independent, bricks and mortar stores, then the town will be economically viable and thriving. Not that hard really. Don’t drive to Rosebud for Maccas, grab a burger at the local fish and chips shop. Cancel the magazine subscription, pop into the local newsagent. Why travel to Melbourne for your clothes or shoes when you could visit your local shopping strip and get something to meet your needs. Get to know your local stores and believe me the benefits will work both ways. American figures state that for every dollar spent in a locally owned independent store 68% stays in the community. Spend that same dollar at a multinational or franchise, that figure drops down to 43%. Our research suggests that the Australian translation of that will be even more impressive. The likely hood is even more of each locally spent dollar will stay at home, and even less for the multinational money. But lets face it, McDonalds and Hungry Jacks make their decisions based entirely on the dollar figure, your local trader isn’t quite so narrow minded, but they still have families to feed and mortgages to pay. Obviously they are going to grow and improve if their customer base does. If our village is seen as a vibrant and viable place to be, other stores of a similar ilk will start to arrive. ‘Build it and they will come’. So next time you complain about the state of our town, I dare you to wonder down to your local cafe and buy a coffee (if you are planning a real whinge, I recommend you settle in, add a piece of cake to your order and then pick up a new pair of shoes on your way home). OK, now that you are going to Donna's Deli instead of directly to Safeway, let's pick it up a notch. Rye’s Up! will now be spending a lot of its time around the town working on far more positive and concrete activities. Don’t worry, the anti-fast food giant lobbying will still be continuing, but there will be less of the protest, more of the productive. Nothing has been finalized as yet, and your suggestions are more than welcome, but lets have a bit of a look at some of the ideas so far. Tree plantings on the foreshore, community garden, an open-air cinema at the carni site, a Beach Treasure Hunt using 'sat nav' to record the location of prizes – great events and great for the whole family. How about increasing some of the cultural and gourmet parts of town, an Art Installation along the foreshore, Tasting Station or night market, a garden competition leading to an open garden event . Maybe some sporting activities, or inter-generational challenges. Kids verses grown ups Petanque or Bocci, Chess games on the foreshore, orienteering competitions, beach volley ball, a marathon walk or run. The list is endless. So not only will we be focusing on the permanent and long running changes for the town, such as tree planting and beautification, but also on some just really fun events that will help harness the town to one goal – Lets Be Great – basically. One such event that we are in the early stages of organizing is the Community Picnic Day. Every year there is an international ‘Anti-McDonalds Day’, the 18th of October. What better way to celebrate that than to completely ignore McDonalds. Instead lets focus on all the wonderful things we have at our doorstep, hence, a Community Picnic Day with great local bands, fantastic local produce, brilliant local traders and the positive and welcoming community spirit that encapsulates Rye. We will keep you posted, but be sure to save the date. After all of this information has been thrown at you (I know it is a lot to take in), I thought it would be a good idea to invite people to ask any questions they have, or make comments. One thing I urge with the most heartfelt plea is BE NICE. Rye’s Up! is doing its very best to treat everyone, person and business, with respect and kindness, please endeavour to do the same. Healthy debate is encouraged, but be aware that there are children in the room and make your comments accordingly. We are almost at the end, but now comes the reminders and housekeeping. For anyone still wondering how best to help here you go. Buy local, write to both the shire and the media, attend events and spread the word. Easy? I think so. Housekeeping – unlike at my house at the moment, that is easy too. Around the room you will see lots of different desks set up, each has a sign above it, just visit the ones that are appropriate to you. You will find letters to sign, petitions, volunteer lists, mailing lists, competition information forms and a Rye Beach Action Group and Friends of the Foreshore information desk. Can I take this opportunity to thank all of the Mornington Peninsula Shire Councillors who have attended this evening, Martin Dixon and Sophie for speaking to us all, and everyone on the Rye’s Up! Committee who have been working oh so hard for many weeks now. On a personal level, I would just like to take this time to send out an ENORMOUS thank you to McDonald's. Throughout this entire experience, and I’m sure still to come, I have been able to meet the most amazing people, think about things that are really important to me, find out about our community and its needs and most importantly I have been given a feeling of power. I feel empowered to voice my opinions and concerns, I feel empowered to make changes and improvements where necessary and I feel oh so powerful when I realize that my voice, along with so many in Rye can, does and will be heard and make a difference. If there is anyone from McDonalds and Hungry Jacks present, please be aware you have done a great thing for the town of Rye. You have opened our eyes to the unique beauty of our community and motivated us to enhance and embrace that. Take your time to have an explore around this glorious part of the country, experience for yourself what it is we are lucky enough to live with every day. It would be greatly appreciated if on your return to your companies you pass on the message, ‘Thanks for all your help, but we can take it from here’. For everyone else, have an explore right here around the information desks, stop and talk to your neighbours, introduce yourself to someone you haven’t had a chance to meet in the past and enjoy your evening. Come along to TONIGHT'S Town Meeting to hear all the latest goings on, plans for the future and THE BIG NEWS! Remember, spread the word and show your support! Help to shape the future of our wonderful town. Click here and distribute the flyer far and wide! Where should I send my letters? Where are the Info Centres? - Become a valuable volunteer! - Seen anything that'd be useful to our campaign? Email: dixonkatrina@hotmail.com. If you don't have email, drop into one of our Information Centres (addresses below) and ask to be placed on the postal mailing list. Poster & Video Competition! - Due 26th June 2009. Keep them away from schools! You will be able to pick up and drop off letters, petitions, any other material and find out about future Town Meetings at these stores. McDonald's: "We will add to community"
12yo hamburger still looks good!